The Blue Marvel faces a nightmare from the depths of the Neutral Zone – and the depths of his past! Meanwhile, Ronin can’t hide from the Deathwalkers any longer……or from the readers! This ish – the mask comes off! Art– Greg land has taken time off the last few issues to clearly put together this gorgeous issue. There are a few hiccups but for the most part this is a good looking book (Yeah I said that about Greg Land’s art). Black Heroes– Blade is revealed as Ronin (gasp), Blue Marvel makes an appearance and Monica Rambeau continues to be used to great effect! Action- Rampaging She Hulk enhanced by Monica Rambea vs Out of control Kevin Brashear was pretty damn cool! 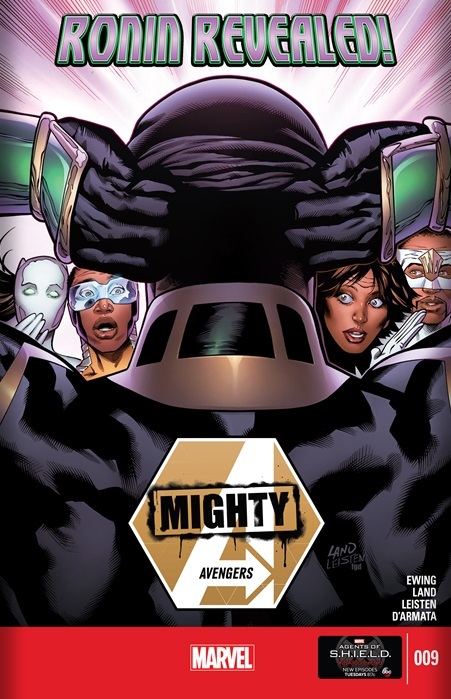 Cover– This issue’s cover touts “Ronin Revealed”, it has the new Ronin taking off his mask in front of shocked Monica Rambeau, Falcon, Power Man and Ava Ayala. Tragedy– This issue makes Blue Marvel move up a couple places on my favorite Black Superheroes list. Like Monet St. Croix before him Blue Marvel has powers that should seemingly make him another Superman clone which is the equivalent of being neigh omnipotent and boring to boot. Instead of dear stale Clarke however Blue Marvel is humanized by the tragedies in his life like Monet. His failure as a father, his retreat from public life as a superhero, his failure to save his wife, all these things makes him a very emotionally resonant character. His strained relationship with Max Brashear, Max’s rebellion against a father who couldn’t save his mother or brother, the loss of his favorite son in Kevin and then the nail in the coffin Kevin’s unstable arrival and having him lost again. When Adam Brashear shed’s a tear this issue I want to shed one right alongside him. Team- The escape of Monica Rambeau and She Hulk was awe inspiring stuff! I would never have thought of it but it makes perfect sense in retrospect. The reveal- This could have been an issue to create waves and set the internet on fire the same way Bendis reveal of Echo as the original Ronin instead this was spoiled so long ago I can’t help but wish it was someone else under the mask just to get a touch of shock or excitement. Yeah. I really liked this issue too. Anyone else like how in the rolling timeline/Marvel Now reboot (I’m not really sure), The fantastic 4 took on Galactus in 1999? They actually put “Dawn of the Age of Marvels” there. It was subtle but huge to me. I realized that as well Michael! My question is how much of this is the writer’s interpretation of the “sliding timeline” vs Marvel official version of the “sliding timeline”.